There are pivotal moments in the life of a city. Historically, Santa Barbara has had many: the Chumash revolt of 1824; the development of the silent film industry; the 1925 earthquake; Pearl Chase’s drive to recast the city in the uniform architectural style we know today; the Union Oil spill that led to Earth Day and the cessation of offshore drilling; the fight to build the tunnel beneath the highway, allowing State Street to run continuously through the city; and the emergence of the Funk Zone. These were all defining moments in the tapestry of Santa Barbara. Now we are living through another pivotal time. Santa Barbara’s most recent moment has been percolating for the last six years, and even decades earlier, along the waterfront in what is known as El Pueblo Viejo District. Much of the history of Santa Barbara old and new is embodied there ​— ​from surfboard shapers to the channel fisheries, cheap hotels, and dive bars. It’s remarkable to realize that the oceanfront was not cherished in the early 1800s. Southern Pacific Railroad laid tracks along the beachside because it was considered the least buildable, least valuable property. That is most certainly no longer true. Changes began early this century, when artists started moving into the industrial rough-and-tumble area that we now call the Funk Zone and a new urbanism developed. Over the years, art galleries, restaurants, curated-cocktail bars, and the cutting-edge MOXI museum opened. 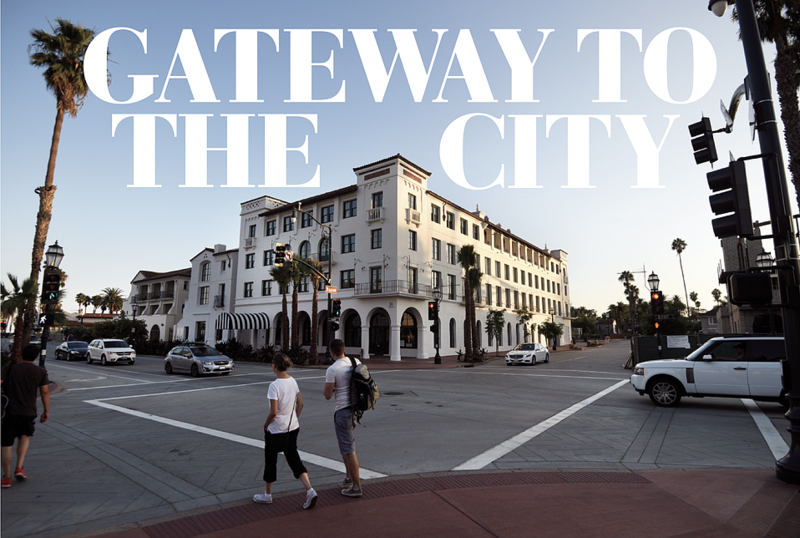 This month marks another significant development: the long-awaited opening of Hotel Californian at the gateway ​— ​“La Entrada” ​— ​to the city, between the beach and State Street. The history of Hotel Californian’s development has been a drama filled with political battles, economic disasters, and civic controversy. But now, after six years of planning and building, the hotel opened this week. It’s as much a fulfillment of a promise as it is a unique and stunning architectural accomplishment. The Hotel Californian is both a celebration and a curated vision of Santa Barbara ​— ​a hotel that will introduce more than 100,000 guests a year to the city, offer employment to hundreds, and become a place where visitors and locals alike can gather to enjoy Santa Barbara. Everyone can judge for themselves how, after such a long struggle, the artists, architects, and hoteliers have succeeded. With its Moroccan-themed interiors and Andalusian accents throughout, the Hotel Californian, from rooftop to tile, is the defining vision of Michael Rosenfeld, founder and developer of the property. He brought together a talented team, including the Santa Barbara architectural firm DesignArc and the celebrated designer Martyn Lawrence Bullard. Bullard’s stunning million-tiled interior, with its clean lines and velvet touches of opulence, gives the hotel its eye-fascinating look, a Moroccan twist on the California beach lifestyle. With Andalusian stylings, an 18-foot Moorish arch, and two paseos ​— ​one along Helena Avenue that blends directly into the Funk Zone, straddling the city’s official design line between the growing industrial area and the historic Pueblo Viejo District ​— ​the designers and builder should be applauded for elegantly integrating so many historic, civic, functional, and original influences. The hotel design is like a magic box: Inside, it reveals itself in new and surprising ways that are not immediately apparent from the outside, a bold example of how innovation can fit almost secretly into a uniform cityscape. The 121-room hotel, which is opening with more than 400 bookings, is one block from the beach, one block from the train station, and one block from MOXI. It includes a luxurious Turkish-inspired spa, a fashion boutique, two restaurants, a world-class ballroom, event lawns and decks, a rooftop pool, and unique meeting spaces for weddings and group events. There are 360-degree views of the Pacific and the Santa Ynez Mountains. One of the most remarkable aspects of DesignArc’s execution is how these views are managed. There is not one bad vista from anywhere inside the hotel. It seems cozy and expansive at the same time. Many longtime Santa Barbarans will appreciate that the façade of the original Hotel Californian ​— ​built in 1925, just before the earthquake and before Spanish Colonial Revival was a dictum ​— ​has not only been incorporated into the building along State Street but honored with meticulous restorations. Even the designs of the original awnings, as well as other original architectural punctuations, have been installed, evoking memories of the storied Rocky Gallenti’s watering hole and its famous Manhattans, which today’s dedicated mixologists would surely appreciate. Speaking with developer and builder Rosenfeld, a loquacious man with a keen interest in everything, it’s clear that the hotel’s realization was as much an organic evolution as it was a meticulous planning.“People ask me, how could you be so visionary as to know that at this moment in time all these things would happen and you would be right in the center of it? And the answer is ​— ​I didn’t,” said Rosenfeld with an easy smile. As CEO of Woodridge Capital Partners, he purchased the property in 2011 with its coastal permits intact in a remarkably prudent deal when the previous developer’s financing fell apart. But the timing is auspicious; it can be seen in progression with the design-driven transformation of the old Santa Barbara Fish Market building into The Lark restaurant and adjacent galleries, wine-tasting rooms, and shops at the heart of the Funk Zone. The hotel’s development and direction begins to answer some of the questions about the future of the city, showing that Santa Barbara is renewable and very much alive. If Rosenfeld is the vision of the Hotel Californian, his managing director, Carlos Lopes, is the soul. A man with an old-world feel and a largesse and generosity of spirit, he is a master hotelier with a very high bar for and understanding of service. He has held key management positions at Hotel Bel-Air and Four Seasons Hotels and Resorts. He has made exceptional service the hotel’s hallmark. For more than two months ​— ​an exceptionally long training period ​— ​Lopes and his general manager, Warren Nocon, have worked with 200 new hires, instituting programs on how to be the perfect concierge, how to make the perfect bed, how to cultivate the perfect hotel. Overseeing the Californian’s two restaurants is Alexander La Motte, previously chef de partie at The French Laundry and executive chef at San Francisco’s Four Seasons. If Rosenfeld is the hotel’s vision and Lopes the soul, then La Motte is the belly. His first cooking experience came in the 2nd grade, when he mistakenly used cinnamon rather than paprika to cook his family’s chicken dinner. His mother liked it so much, it became a regular family dish and will be a special at Blackbird, the hotel’s primary restaurant. Blackbird will have a Mediterranean feel with North African influences. “It will be upscale but informal. We want to break down the barrier of formal dining. We want you to feel like you’re coming home, that we’re welcoming you back.” Local sourcings will include the Santa Barbara Farmers Market, Watkins grass-fed pigs, and an emphasis on Santa Barbara fish, including sea urchins from John Hoadley. There will also be a casual street-facing café, dubbed Goat Tree, with counter service. There’s already a collegial relationship between La Motte and other cooks in town. During the recent microburst weather event, when The Lark’s coolers went down, the hotel provided refrigeration help. No one understands the significance of a new hotel to social life and commerce better than the lead wedding planners of this area, who are considered the very best in the country, if not the world. On a recent tour of the hotel, three of Santa Barbara’s most famous planners yielded a sense of how the Hotel Californian fits in the tiara of Santa Barbara’s finest hotels. Jessica Kuipers of Bijoux Events, a vivacious, boisterous personality known for her nontraditional, creative, edgy designs, agreed. “The Hotel Californian will get the rock-and-roll guest, the writers, the entrepreneurs; it’s perfect for the quirky kind of weddings.” Rani Hoover of Rani Hoover, Inspired Weddings & Events focused on the importance of the hotel’s location. “Most people don’t come here to be removed or tucked away into a resort full-time.” With easy entry to the Funk Zone and everywhere in Santa Barbara, the Hotel Californian is a merger of accessibility and luxury, creating a unique opportunity for visitors to experience every aspect of the American Riviera. There’s a lot of change in Santa Barbara’s hotel world, with the Fess Parker converting to the Hilton brand and the Bacara having transferred to the Ritz-Carlton. The likely rise in the level of competition is sure to benefit Santa Barbara’s wide range of service industries. With the economic changes on State Street an ongoing focus of City Council and the mayoral race, and with a potential new art zone on the lower Chapala corridor; the housing developments on Haley; and the development on De la Vina, including an expansion of Handlebar Coffee Roasters, there are important changes all over Santa Barbara. Down at the waterfront, more work needs to be done. Hopefully, a world-class hotel will prompt a new look at the outmoded beachfront solutions by Stearns Wharf that retain above-ground dredging pipes and stifle the Mission Creek Lagoon. Perhaps the demand for better aesthetics, recreational use, and preparations for sea-rise resilience will motivate the town to clean up and relocate the antiquated tide gate and pump station to provide a more welcoming, safer place for people and wildlife. Sitting in his Woodridge Capital offices recently, Rosenfeld marveled at how everything has come together. “When I started, this was a hole in the ground. From that moment to today, the process of working with the community, the city agencies, and then the architecture and interior design, even making some of our own tiles ​— ​to actually see that come together has been amazing.” It reminds him of the advice he recently gave his son. “You only have a few true turning points in your life. It’s important to recognize as best you can those significant moments and enjoy them.” This might be one of those pivotal moments for Santa Barbara, the gem of the California coast. It confirms that there are likely many more to come. TynanGroup was the Project Manager and Construction Manager for the Hotel Californian.